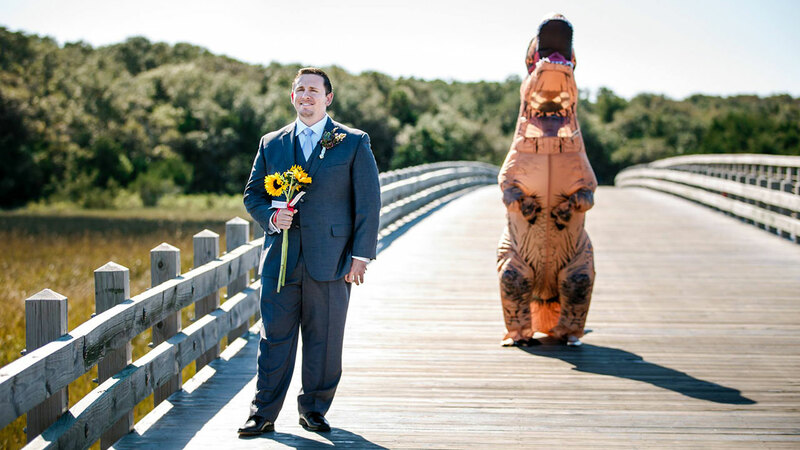 RALEIGH, North Carolina -- A Chicago bride got a little "Rexy" before her wedding on North Carolina's Bald Head Island. Jon Murray, a videographer from Raleigh, captured the bride's hilarious first look surprise for her groom before the couple's November 5, 2016 wedding. In the video, Tom Gardner is seen holding flowers with his back turned, waiting to see his soon-to-be wife Beth. His anxious look quickly turns into delight when he turns around and sees Beth wearing a T-Rex costume. "I was totally floored when I turned around and saw her in this," Tom wrote on Facebook. Video of the Gardners' adorable moment was posted on Facebook Monday and already has well over a million views. "It just warms my heart to see that so many people got a giggle out of this too," Beth commented.